A child fell out a window on the ninth floor of an apartment building in Silver Spring, Md., Thursday afternoon, according to Montgomery County police. A tree helped break the 4-year-old boy's fall in the 8800 block of Piney Branch Road about 3:15 p.m., News4's Shomari Stone reported. The woman who found the child said he was crying in a bush. She didn’t know who his family was, so she called 911, Stone reported. He suffered head injuries and a broken femur and was taken to Children’s Hospital in serious condition, according to Montgomery County Fire and Rescue. 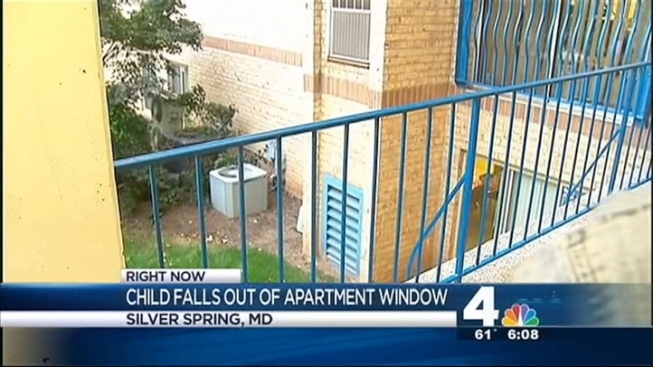 A 4-year-old boy fell from an 8th-story window Thursday in Silver Spring, Md. News4's Shomari Stone reports. Family members were in the apartment when the boy fell, Stone reported. Police and Child Protective Services are investigating the circumstances of the fall. Stay with News4 and NBCWashington.com for the latest.